The decorative concrete pool deck is one of the trending designs in most homes. This is an inviting, textured, and colored area that surrounds the pool and provides a safe and slip-resistant deck for barbecuing and sunbathing. Currently, in-ground pool decks are given equal importance to the one that is given to the interior design of any home. Decorative concrete has now opened doors for the creation of pool decks that are able to compliment the exterior of your home quite well. This melds quite well with the outdoor environment and reflects traditionally expensive and exotic materials like wood, stone, and slate. Some people normally refer to them as cement pool decks. The choices that are available for designing an affordable, functional and truly unique pool deck are just at your fingertips. You can choose the design, color, and texture that you feel best suits your home. The material is another primary determinant of your structure. Most people go for concrete pool decks because of the many benefits that they bring into the home. Concrete is well known for producing surfaces that are extremely durable. You cannot compare the quality of concrete to wooden decks or even stone ones. The new techniques of stamping and the application of decorative concrete will guarantee you an excellent look at a very minimal cost. Truth is said, the applications of modern-day concrete are highly flexible and concrete pool decks is just one of them. Stamped concrete decks are becoming more popular than ever before. Homeowners are turning to these concrete decks because of the fact that they are highly attractive. However, its good to understand the pros and cons of concrete pool decks before you turn to them. One of the greatest advantages of decorative concrete pool decks is the great look that they bring in your home. The products will allow you to create a look that is completely customized in your home. They can typically produce any design that you think of making it appropriate for any theme in the home. This allows homeowners to be highly creative and work with their remodeling contractors to give their pool decks the best look. Concrete pool decks are also relatively inexpensive. In fact, stamped concrete is the least available options when you compare with what is in the market. It is cheaper to use concrete in your deck areas than going for tiles and stone. What an excellent way of getting a deck that has a stunning looking without breaking the bank. 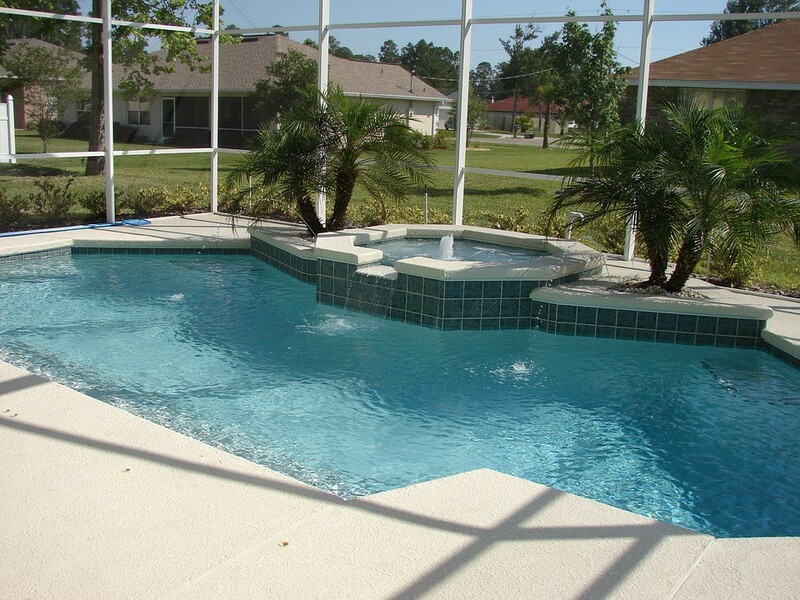 Its also quite simple to maintain concrete pool decks because of the features of the material. You will not be bothered with gaps between the material or grout lines. The concrete slab is big and hence easy to clean and seal. Occasionally, you can use a power washer to deep clean your concrete pool decks. This process is simple and anyone can do it. The main undoing of the concrete material is that it cracks with a lot of ease. Some people try repairing a crack that has already occurred but this is not the best way forward. It may end up developing into an eyesore that has a worse appearance than simple cracks. The other challenge with concrete is that it is very hard for you to match the original color if you want to add something in the future. You can use dyes to bring a unique look to your concrete pool decks during the installation process but this can be challenging along the way. Contractors can find it hard to match the colors and this may pose several problems along the way. There are several decorative finishes that are available for concrete pool decks. You can make it in such a way that it matches with your concrete driveways, patio, and other exterior spaces. It is the best way to get an attractive and customized look for your home. You can decide to use concrete staining or a special concrete paint to give your exterior an elegant look. You can also get prints that can create specific patterns on your concrete pool decks.